A bomb placed on a bus ferrying Lebanese pilgrims around Shia holy sites in Damascus exploded Sunday, killing at least seven people, according to Syrian activists and Lebanese media. The bombing underscored the sectarian nature of Syria's four-year war, and how neighbouring Lebanon has become ensnared in the complex conflict. The attack wounded at least another 20 people as it shattered the vehicle near the Damascus citadel and the centuries-old Hamidiyeh bazaar, state-run media reported. The Britain-based Syrian Observatory for Human Rights, which relies on a network of activists inside Syria, said the blast killed seven people. Their death toll was slightly higher than that given by state-run media and al-Manar, the television channel run by the militant Lebanese Shia group Hezbollah. Conflicting casualty tolls are routine in the aftermath of such attacks. Footage broadcast on al-Manar showed a woman, seemingly in shock, lying on a hospital bed, her white shirt crimson with blood. A medic picked shrapnel or glass out of a man's bloodied back. Al-Manar said the Shias were travelling to the southern shrine of Sayidna Zeinab from the shrine of Sayidna Ruqqaya in central Damascus when the bomb exploded. The bus belonged to a Lebanese Shia pilgrim tour company and had left Beirut early Sunday morning, company official Fadi Khair el-Deen told al-Manar. Another bomb found near the bus was dismantled by security forces, Syrian state-run media reported. It was not immediately clear when or how the bomb was placed on the bus. Syria's al-Qaeda affiliate, the Nusra Front, claimed responsibility for the blast, and accused the bus passengers of being Hezbollah fighters. 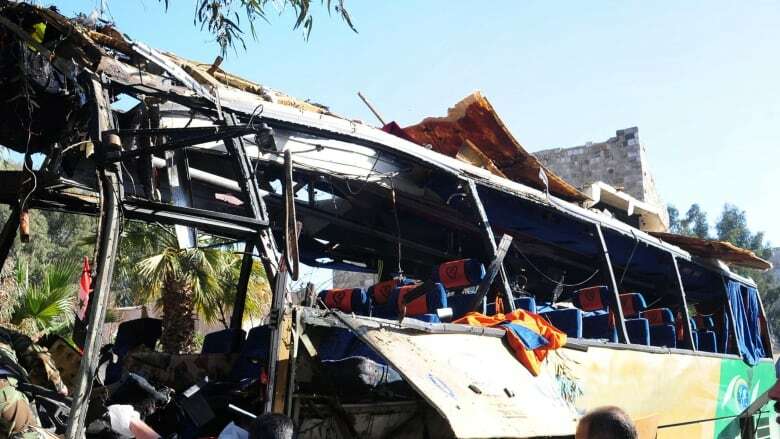 The Nusra Front also claimed it was a suicide bombing, while Syrian state media and al-Manar both said the blast was caused by a bomb placed on the bus. The Nusra Front claim spotlighted why the pilgrims were likely targeted — as revenge for Hezbollah fighters defending Syrian President Bashar Assad. Hezbollah's direct participation in the Syrian conflict has prompted hard-line Sunni radicals to lash out against Shia communities in Lebanon.